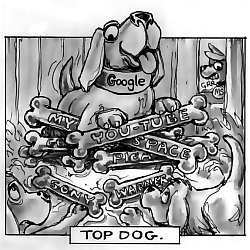 The take-over of YouTube by Google has profound implications for the online video market. It follows the announcement by Warner Music Group that they will be providing their entire library of music videos to YouTube, free to watch and download. The company will share the advertising revenue with YouTube. The democratisation of video making, and sharing, that has been driven by the growth of YouTube is astounding. The primary users of the site—and they are providers of content as much as they are its consumers—are 12 to 17-year-olds, the younger half of "Gen Y". The site has grown, on the back of this audience, to the point where more than a hundred million clips are watched on the site every day, and further, around 65,000 videos are added daily. The numbers are staggering. The proliferation of camera phones, cheap digital cameras, and broadband internet connections has facilitated this growth. Now everyone can be an auteur, and share their work with the world. Other media organisations, such as the American TV network NBC, have also started seeding the site with promotional videos. The logic seems to be, if they can’t stop the copyright infringements, they may as well make some money from it, and get some free promotion into the bargain. The decision marks a major shift in the way media organisations are thinking about content provision. The deal that allowed Apple to provide video content on its fifth generation iPods was seen as revolutionary in itself—an opening of the flood gates for legal video online. 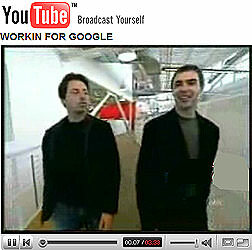 The model was still user-pays, though; with YouTube, a new model is being used. Online distribution of entertainment content will continue to grow. The moments in the sun enjoyed by Napster, then Kazaa, currently iTunes, and increasingly by YouTube, demonstrates that, as new technologies become more sophisticated and pervasive, people become accustomed to deciding how and when they consume. The take-over has stirred particular interest as some analysts have warned that any take-over would be fraught with difficulty. The reason for this is clear. Many have warned that “big media organisations” have been waiting for a company with deep pockets to take over YouTube, and once this purchase was completed, the lawsuits would begin. YouTube operates on a client-server model, which places much responsibility on the shoulders of the owners of the site to vet copyrighted material, and leaves it vulnerable to such lawsuits. The so-called "viral" nature of popular YouTube videos has also set marketing minds racing. Rather than achieving their popularity through advertising campaigns, videos that become popular on YouTube do so through "word of email", and users visiting, re-visiting, and rating videos. One could argue that the harbingers of this shift have been there to see, for those willing to look hard enough. News Corporation’s purchase of MySpace for $900 million seems a similar move to Google’s. MySpace is an extremely popular online blogging and social meeting place. By outlaying such a large sum, News Corporation has claimed the dominant position in the market. It looks a shrewd investment, as Gen Ys interact online more and more. The 12 to 17-year-olds of this world have more and more spending power and free time, and advertisers know it. For the young, the attraction is in the sharing of the minutiae of daily life, online. For the advertisers, it’s about traffic, hits, and market share. When the famously litigious Microsoft introduced its Zune media player, one of the most surprising features announced was the facility to share, wirelessly, one's songs with one's friends. Not even hip-and-friendly Apple, the darling of new media, had allowed this facility in its iPods. The pressure from media companies to restrict the likelihood of copyright infringement has been too great. The battle for the living rooms of 21st century consumers has begun, and all the big players are fighting for a piece. Google, with billions in the bank from its Initial Public Offering, has gambled on YouTube delivering market supremacy. In a survey conducted by Hitwise.com, YouTube is estimated to have 42 per cent of the online video market, while Google Video has around seven per cent. Another survey of the UK by Hitwise put YouTube’s marketshare as around 64 per cent in that market. When these figures are taken into account, the $2.2 billion in Google shares distributed to YouTube, in exchange for ownership, looks like good business. Time will tell whether Google has guessed right. 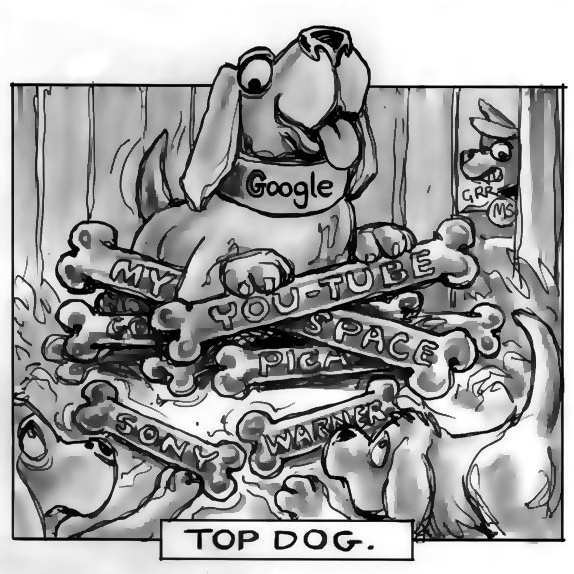 Some have predicted that new software, such as the elegantly named "Democracy", which runs on the decentralised peer-to-peer model, will supersede YouTube now that it has "sold out"—but for Google, the gamble is worth taking. Guess right, and they stand to reap billions in the coming decades. Guess wrong, and 67 people from San Mateo, California are still happily sharing in a bonanza—and the chances are that Google will only make slightly fewer billions. In the meantime, TV audiences continue to decline, youngsters flock to the site, to watch the Lonelygirl15s of this world and share their lives through their videos and personal journals. The shift towards a decentralised, globalised world continues apace. Youtube is a great way to waste time, but I'm not sure that anyone will be able to make money out of it. fascinating article. as psychologist who works with families -are parents exercising discernment and interity re childrens choices regarding future role modelling in the world of communication and the implications for their children and what does this mean.